Saturday. Saturday was intense at our house. Once I was back at the house, Mark went to Lowes to get some materials to finish our dog run. He only got the 2''x4''s for the cross-sections. So together, we cut and nailed them to the posts. By 'together' I mean: Mark did most of the work. I just tried to look cute and hold the wood in place while Mark nailed. Once we were finished with the cross sections, I sent Mark back to Lowes (because we are efficient and eco-friendly like that) to get the pickets. Guess who got to nail the pickets on the fence while Mark watched Chloe?!? Me!!!! I loved it. Honestly, working outside with my hands is a lot of fun. What a sense of accomplishment it is! So here are some pictures of our handiwork. We just have to finish the gate. We ran out of nails and figured that three trips to Lowes in one day was too many. 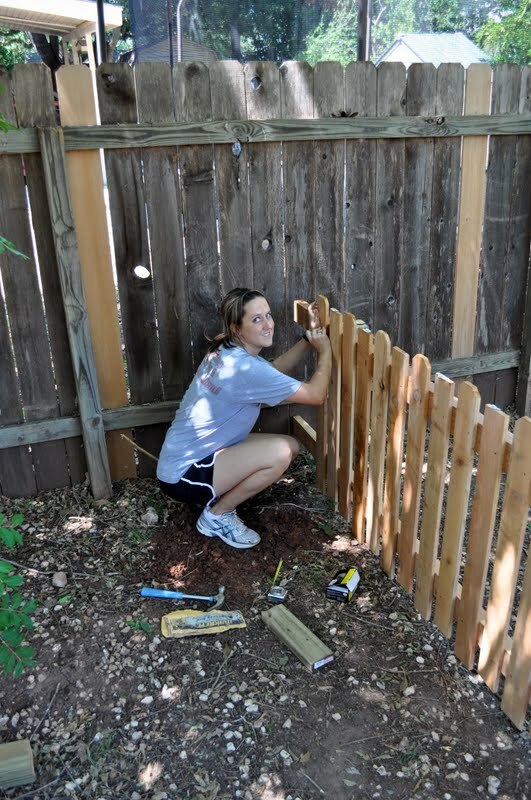 Pretending to hammer...or smash the fence. 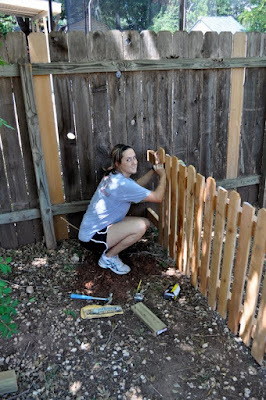 After we finished with the fence for the day, I was off to shower and get ready for a bachelorette party. That's a story for another day. But I will say this: I am WAY TOO OLD, MARRIED and MOM-ish (not to be confused with Amish) for that...even though I did enjoy hanging out with the girls! Painting with her meat and sauce. Good job on the fence. I bet Ms. Pepper is wondering why Clyde has to stay in there, ha. Chloe sure makes her food look good. And whatever you ran - that's way more than I've run in ... well... a few years LOL Good job!!! Glad you got to run in the cool morning. I liked seeing you run in high school. The fence is nice and your yard looks good too. Pepper may be wondering who is moving in to this part of his territory? Chloe made me hungry so I had to go fix my supper. She enjoyed her meal more than I did.